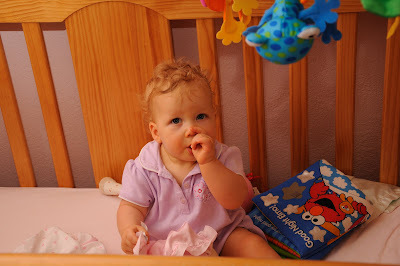 Savor The Days: Rachel is 10 Months Old! Rachel is 10 Months Old! Rachel turned 10 months old yesterday! I already miss that newborn state when she would just let me rock in the glider while she slept in my arms. Now she's all wiggle worm and determined to explore every inch of the house. Rachel is pulling up to stand but doesn't cruise yet. But still she keeps us on our toes as we are constantly having to watch what she can get into - and double check everywhere for little toys that Nicholas may have left behind. Today she started crawling on her knees instead of her usual commando crawl. However, I had her in a little dress and it kept tripping her up when she crawled. This wasn't a problem when she was commando crawling and sliding around on her belly. So I guess I'll have to put the dresses away for a while. 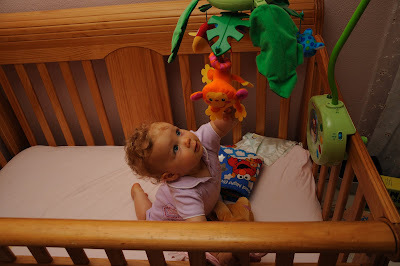 These pics were taken just before she started pulling up to stand so her crib mattress is still in the top position. 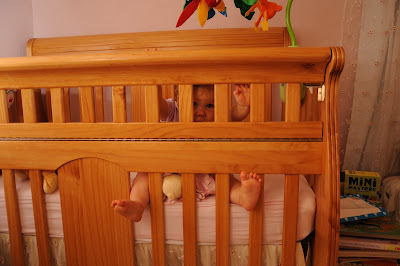 It has since been lowered so that when she stands up, she is still too low to be able to pull herself over the top of the crib. No escaping for you, little one! Why aren't you picking me up? You know I want out of here!! She is a happy little girl except when she's dealing with teething pain. Her bottom right front tooth has been working its way up for a while but a few days ago Stuart noticed that her top right front tooth has made an appearance! When Teething Pain Strikes...Just Have Fun!